NEW YORK – MARCH 29, 2011 – Kent M. Swig, President of Swig Equities, LLC, is pleased to announce that the firm has completed 10 leasing transactions in its FiDi (Financial District) commercial office portfolio thus far in 2011, totaling over 43,000 square feet. Numerous leasing transactions were completed within Swig Equities’ New York City FiDi neighborhood properties, which include 110 William Street, 48 Wall Street, 90 Broad Street, 5 Hanover Square, 80 Broad Street and 44 Wall Street. “Each of our buildings provide superb services and excellent commercial amenities which appeal to tenants who desire a prime business location with strong management,” said Todd E. Korren, Executive Vice President and Director of Leasing and Operations at Swig Equities. Of the various leases signed within the Swig Equities portfolio in FiDi, 5 Hanover Square, a 25-story, 325,000 square foot multi-tenant office building built in 1962 and designed by architect Henry G. Green, was the most active property, with over 15,000 square feet of leases signed. Some of the notable leases at 5 Hanover Square include Odyssey Financial Technologies, a member of the Temenos group (represented by Shay Pope, Derek Myers and Jessica Staple of Newmark Knight Frank) with 7,620 square feet; Xcitek, Inc. with a 7,155 square foot lease extension; and Lambert Development with an 840 square foot lease extension. 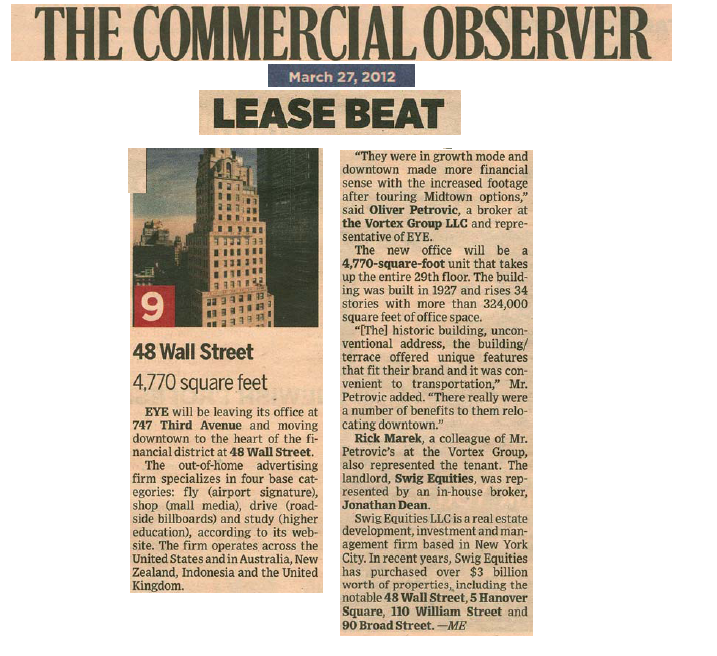 At 80 Broad Street, a 36-story, 400,000 square foot multi-tenant office building, over 14,000 square feet of leases were signed. Renewals include R.F. Lafferty (represented by David Ofman of The Lawrence Group) for 9,500 square feet and Relocation.com for 3,095 square feet, and a new lease was signed by accounting firm Omimi & Associates (represented by Sadah Ali of Vicus Partners) for 2,320 square feet. At 90 Broad Street, a 25-story, 400,000 square foot office building, renewals include Pacnet USA (represented by Jeffrey Symmons of The Lawrence Group) with 2,821 square feet and Concrete Stories with 2,702 square feet. In addition, Merchant Solutions Group signed a new 3,095 square foot lease at 110 William Street, a 32-story, 900,000 square foot multi-tenant office building. Also, Cellfun, Inc. signed a 4,625 square foot lease extension at 48 Wall Street, a historic 324,000 square foot office tower built in 1927 and now home to the Museum of American Finance. “With 10 deals closed to date and over 43,000 square feet in the first three months of 2011, we are optimistic about the strength of the market and the prospects for our properties. We look forward to building and expanding upon our accomplishments while maintaining our momentum throughout the remainder of the year,” added Mr. Swig.